Two years ago, reports EV World, the land next to GM’s White Marsh transmission plant just north of Baltimore was an open, grassy field. 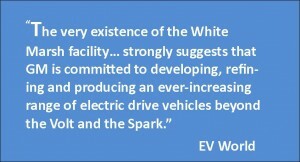 Today, it’s the site of the first plant in the U.S. built specifically to supply electric motors for electric vehicles. The new 110,000 square-foot facility will supply the motors to power the Chevy Spark, a low-volume model that will go on sale later this summer in California and Oregon. The west-coast-only availability is due California’s rigorous emissions regulations: the state goes beyond federal rules by requiring automakers to increase the percentage of zero-emissions vehicles they sell. By 2025, one out of every seven vehicles sold in California will be EVs, plug-in hybrids, or fuel-cell vehicles. GM also plans to sell the Spark in Canada, Europe and South Korea. No word yet on when – or whether – it will be available in the rest of the United States. When it hits the market in June the Spark will have a Fast Charge option, allowing the battery to recover 80% of its charge in 20 minutes or less. That’s much faster than most current EVs, which can take four hours or more to recharge. The Spark is assembled in South Korea, but the electric motor is not its only critical made-in-USA component. The vehicle’s lithium-ion batteries are produced by battery-maker A123 in Livonia, Michigan. GM’s new Maryland e-motor plant was built with a $105 million loan from the U.S. Department of Energy (DOE) and a $121 million investment from GM. In its start-up phase, the plant employs about 20 workers, members of UAW Local 239. The GM transmission facility next door –which builds 2-mode hybrid transmissions for pick-ups and SUVs, among other products – now has about 250 employees, an increase of 65 workers since 2010. GM and local officials say the White Marsh plant is poised to capitalize on the potential growth of the electric vehicle market. With new fuel standards requiring more high-mileage, low-emission vehicles, other companies are making similar bets. Battery maker LG Chem announced this week that it will begin production of lithium-ion cells for EVs at its Holland, Michigan plant in July. The Michigan-made batteries are initially slated for use in the GM Volt, which is assembled in Hamtramck, Michigan. LG Chem has been the target of criticism for accepting a $150 million U.S. government loan, even though production was delayed at its U.S. facilities due to slower-than-expected EV sales. Kim Jong-Hyun, who directs LG Chem’s battery division, tells Reuters he expects the EV market to grow as improved technology leads to a drop in vehicle prices. 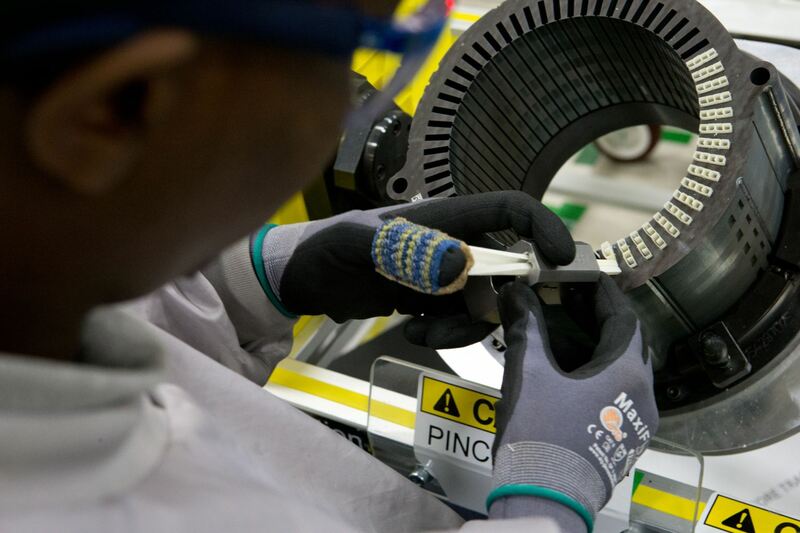 Nissan is now operating the largest lithium-ion plant in North America. The Smyrna, Tennessee battery facility supplies an adjacent assembly plant which produces the electric Nissan Leaf. Nissan received a $1.4 billion DOE loan to aid in re-tooling the Smyrna auto assembly plant for EV production, and to build the new battery plant. Onshoring production of the Leaf and its lithium-ion battery to the U.S., reports the Wall Street Journal, helped Nissan cut the price of the vehicle to $28,800 in 2012. The $6,400 price drop is a result of reduced shipping costs and savings on foreign exchange. Government support for advanced technology vehicle has been controversial. Critics say it’s a green boondoggle, promoting vehicles that have not yet gained widespread consumer acceptance. But the market for full and partially electrified vehicles continues to grow. EVs and hybrids accounted for 3.8 percent of U.S auto sales in in the first quarter of 2013, a steady increase from 2.2 percent in 2011. As the market continues to grow, as EV prices begin to drop and as more U.S. workers are hired to produce advanced vehicles, using public funds to kick-start new technology is looking more and more like a good deal for U.S. taxpayers. 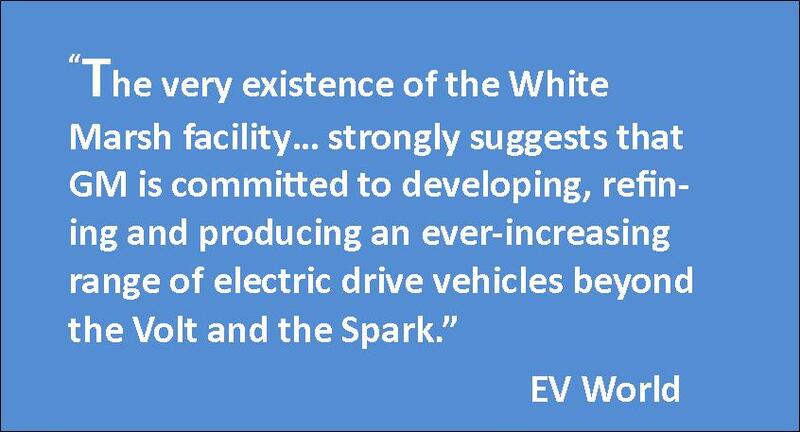 The very existence of the White Marsh facility, along with other EV-specific infrastructure development…. strongly suggests that GM is committed to developing, refining and producing an ever-increasing range of electric drive vehicles beyond the Volt and the Spark.